For the last two decades the world has been trying to explain how arsenic leaches into groundwater in the Ganga-Meghna-Brahmaputra floodplain. Solutions, however, are very few. An estimated 100 million people are still at risk from contamination. The latest research says floodwaters can remove arsenic. 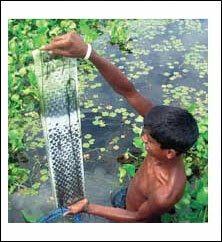 A team headed by Linda C Roberts of the Swiss Federal Institute of Aquatic Science and Technology in Switzerland came to this conclusion after sampling floodwater that contained arsenic in rice fields of the Munshiganj district of Bangladesh during the 2006 and 2007 monsoon seasons. An estimated 1,360 tonnes of arsenic are pumped up by the tubewells and added yearly to the fertile soils here. “When rice fields were covered with floodwater, oxygen could not enter the soils quickly. Aerobically respiring microbes then used other substrates to sustain their metabolism, such as iron minerals found in the soil. This led to dissolution of the minerals and released the arsenic adsorbed on their surfaces into the water. From there the arsenic entered the floodwaters and was carried to rivers as flooding receded,” explained lead author Linda Roberts. The study, published in the December 13 issue of Nature Geoscience, said 57 per cent of the areas in Munshiganj are accumulate floodwater upto a depth of 0.9m in the monsoons. “The floodwater level should be high enough for flushing arsenic out—10 cm of stagnant water in a field can lead to arsenic release from the soil, but is not enough for its removal to a river,” said Roberts. Balancing between the positive and negative impact of flooding could be tricky, though. “If the negative impacts are too large and embankments are in place to successfully prevent flooding, then people must be aware of the increased risk of soil arsenic accumulation and use other means to combat it like shifting to crops that demand less irrigation water,” added Roberts.